Dust off your rock ‘n roll skirts and leather jackets and get ready for the 2016 Live at the Bandstand: Rockabilly and Rock ‘n’ Roll. We are transporting you back to the 50’s to embrace those swinging steps, sassy styles and sweet sounds of rock and roll. This year Battersea Park’s beautiful bandstand has been programmed by The Magic Garden Pub and included the The Lavender Hillbillies, The Orange Circus Band and Big Joe Louis plus many more. The Bedford Pub will be bringing a well stocked bar with wine, beers, Pimms and soft drinks and there will be a huge variety of food stalls from American burgers and sliders to wood fire pizzas. Browse a selection of market stalls selling children’s clothing, gifts, face painting and the ever popular Wax Hands will be at the event, alongside Carter’s funfair and the Friends of Battersea Park stand. Have you ever wanted a 50’s inspired hair style or vintage make up? 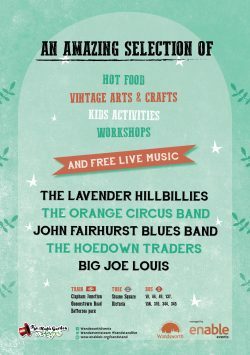 Head over to see Jessica Hart or Lola Glass who are on hand to offer free hair styling and vintage make up make overs. Wandsworth Radio will be broadcasting live to all households in the Wandsworth area. 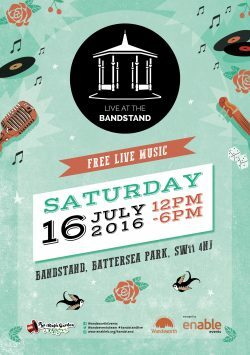 Live at the bandstand is managed and delivered by Enable Events Team on behalf of Wandsworth Council.